There are many different systems and theories for working with crystals and crystal energy. Sometimes elements of one system will contradict another . One system will tell you to use and wear Obsidian constantly for grounding ,another will tell you never to wear it at all and to keep Obsidian covered when not it use . One system will tell you to only use perfect clear natural crystals and other will tell you that chips and clouds and flaws are enhancements. Yet another will say that only carved spheres and wands should be used . In some systems you must have a specific shape of crystal for each use and for other systems one crystal can be used for any purpose at all. Some will use only clear quartz and many systems use a Rainbow of crystals and others will only use one or two or three colors at once. Some systems are full of warnings and precautions, others are anything goes. Some are very precise and formal and use methods based on years of recorded research Others rely primarily on the intuition of the practitioner and /or the recipient of the crystal work. These differences may seem very confusing. Remember that each person is drawing on Their own experience and knowing. We will each find or receive ways of working with spirit and with crystals that are in harmony with our own vision and mission . You may find that most of the systems work for you at least to a degree. There are a lot of very clear and not so clear explanations for how crystal healing works and where it comes from. The sacred geometry of the crystalline structure causes healing by resonance vibrating your energies into sub molecular coherence . The shape and numerological significance of the underlying crystalline lattice is the most important factor. Crystal healing is a Gift from ( Spiritual Indicator Here). Crystals are the echoes of the cosmic cycles. astrology is the key. The color and appearance of the crystals operate on the doctrine of signatures. The Pleadians planted the crystals as healing devices. Crystals are a remnant of Atlantean Technology. The innate Spiritual energy awareness of the crystals themselves creates healing. The chemical composition of the crystals facilitates healing. Crystals act as transmitters and transformers for universal life force energy. The Ascended Masters communicate and heal using crystals as a tool. We Are crystals, The Earth Is a Crystal ,Crystals are all there is . The Spirits of the crystals and of other elements is the force of healing and wisdom. Crystals are carriers of the Sacred rays of creation. Crystals don't do anything but give the mind an anchor, any other method will do too. The names of the crystals carry the purpose -Moldavite is for mold, Apatite is for eating disorders etc. This is the gift of the Earth Mother and Sky Father. You get the idea. I'm sure I've missed quite a few and in case you wonder, I did not make any of these up. The question is Does it work? What system works? and the answers are Yes it does and they all do. Some ideas and ways of working with crystals work better for me than others do. I do not personally find as much use for the sometimes elaborate crystal devices and fancy layouts of some of the Atlantean Temple Schools even though I've had an occasional view of such a possible past dimension. I am committed to life on Earth and doing what I can here and now so do not focus much on methods of ascension . I am not waiting for the spaceships . Whatever the underlying theories behind each of the many systems of crystal work It may be possible to separate the basic systems into broad categories although such categories would overlap considerably . The technical or technology systems: are those that address the crystals as objects as tools or machines Either from ancient civilizations, off world colonization, or modern Science. Structural systems: which deal with the physical properties , the chemical and structural makeup of crystals or even with numerological correspondences and alchemy. Mystical systems: which by various means seek harmony with the Spiritual Core both personal and Universal. The range of these is extremely broad and encompasses shamanic and religious and visionary practices related to crystals. These are just offered as launching points for your thoughts and intuition. There are some very interesting theories and methods of working with crystals in some of these schools . We will look into them a bit and if they sing to your heart then follow that path . I have had Rock Deva talk to me and rock energies run pulsing through me So that has more influence on me than some of the more purely mechanical approaches. I like to acknowledge the life of the stones . Many of the older ways of working with crystals are largely obsolete as many more people are becoming aware of the living spirit and consciousness that permeates everything. 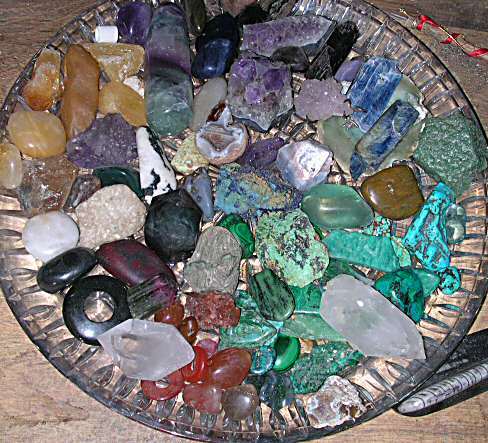 We are committed to recognizing and communing with the living spirits of the crystals and crystal Deva This means that we will have to reexamine many of the conventional practices and presumptions of crystal healing. When I first began writing about crystal healing I received reassurance that at that time writing of and from the traditional object centered concept of crystals as tools was acceptable as it was then the only way to get some of the crystals messages through to those who would immediately reject any spirit centered approach..
Several years have passed now and we are finding that many more people are comfortable with working with the crystals as companion beings . We hope to gradually revise more of the articles in our " workshop" to more accurately reflect this reality. It does not matter if crystals talk to you or not everything is of the whole. The face I see may differ from what you see. We can each discover our own ways of being . There are healing and spiritual and magical practices involving crystals in virtually every Culture of the world. As with the ability to make bread or beer or use fire, when you really dig down to the early stories, what you hear is that Spirit Or spirits gave humans this gift. Usually to bail us out of some mess we had gotten ourselves into or on occasion to reward someone for some particular kindness, courage, bravery, virtue or perseverance . Great article d_redant. For myself I've no doubt that crystal healing works. The "problem" with crystals for me is that I need to be aware of when the effect becomes too strong. Sometimes just 24 hours longer with a particular crystal is like too much medicine. I also really agree with the stance that the best way to understand a crystal is to communicate or meditate with it myself. There are so many books that seem to regurgitate the exact same information and from experience I've found that some of the information seems to be inaccurate. I like to look at crystals in the same way as I'd look at people, some I just get along with right away and others not so much. All seem to have their place at the right time though. The huge details of your sharing about the theory and speculations for the healing crystal within your analysis and research, could be helpful to know more deeper.